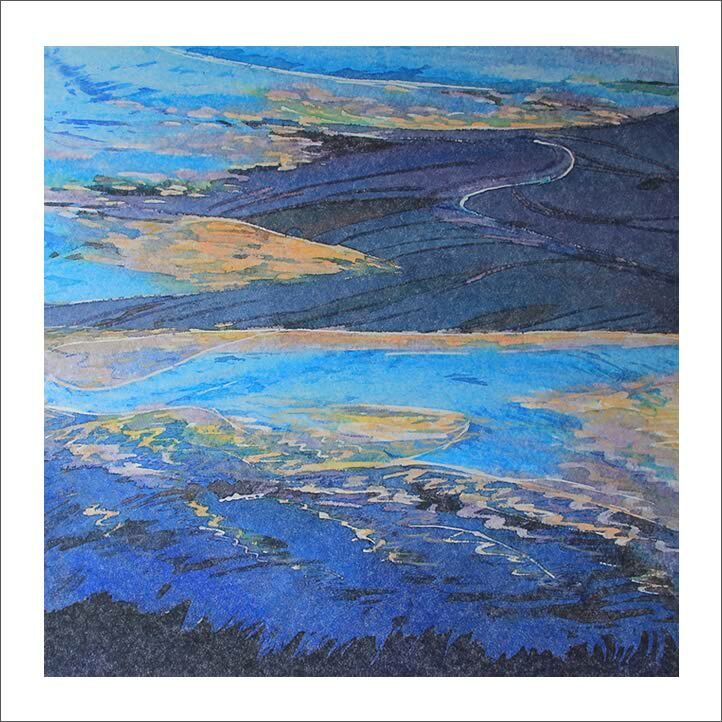 Barbara Meynell works in a variety of media, mostly creating landscape inspired paintings through the medium of batik. She works on smooth and fibrous paper, drawing with heated wax and painting with dyes. Her pictures are either created as a whole, or the paper is cut and torn for collage work. She sometimes incorporates soft pastel to highlight some areas. Barbara also paints in oils. Barbara travels widely, but her main inspiration comes from her walks in Snowdonia, on the mountains or along the coast. She loves the colours of nature and aims to bring a sense of drama and atmosphere into her work. Barbara is a member of ‘Two Rivers’ art group and Deeside Art Group. She won the landscape award in the 2007 WSA exhibition. In February 2015 she had one of her batiks accepted for the Royal Cambrian Academy Open Exhibition.